When you stay at Myrtle Beach Marriott Resort & Spa at Grande Dunes in Myrtle Beach, you'll be on the beach, within a 15-minute drive of Barefoot Landing and Ripley's Aquarium. 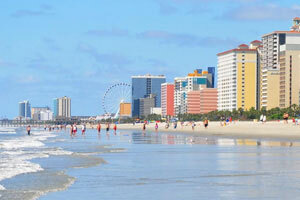 This 4-star hotel is 6.4 mi (10.3 km) from Broadway at the Beach and 6.4 mi (10.3 km) from SkyWheel Myrtle Beach. Make yourself at home in one of the 405 guestrooms featuring refrigerators and DVD players. Your pillowtop bed comes with down comforters and premium bedding. 32-inch Smart televisions with cable programming provide entertainment, while complimentary wireless Internet access keeps you connected. Private bathrooms with shower/tub combinations feature rainfall showerheads and designer toiletries. Enjoy international cuisine at Ocean's on 82nd, one of the hotel's 3 restaurants, or stay in and take advantage of the room service (during limited hours). Snacks are also available at the coffee shop/café. Wrap up your day with a drink at the bar/lounge. Buffet breakfasts are available daily from 6:30 AM to 11 AM for a fee. Featured amenities include a business center, express check-in, and express check-out. This hotel has 11 meeting rooms available for events. Self parking (subject to charges) is available onsite. The preferred airport for Myrtle Beach Marriott Resort & Spa at Grande Dunes is Myrtle Beach, SC (MYR).